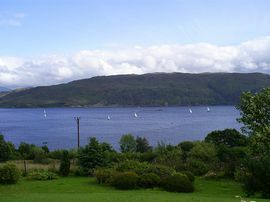 Lochcarron village in Wester Ross is in the midst of some of the most spectacular scenery in Scotland. Stay for a few days to enjoy the true beauty of the area. There are excellent restaurants with musicians playing some evenings. Boat, kayak and fishing equipment are available for hire. Local art and other crafts are also available for purchase. 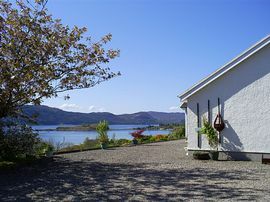 Visit Hamish MacBeth's Plockton en route to the Isle of Skye then take the ferry back to Glenelg, up over Mam Ratagan towards the Five Sisters of Kintail visiting Eilean Donan Castle en route and to Lochcarron. 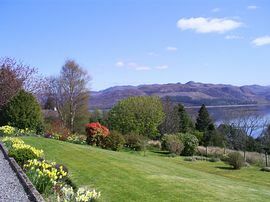 Many Munro Mountains await the more adventurous but if you would like a relaxing walk, simply visit our beautiful Attadale Gardens. From £28.00 per person including full breakfast. Single £35.00 off season, Easter-August £45.00-£50.00. French. You couldn't do it better. Thank you a lot! French. What a shame it's not in the B and B of Scotland guide (with 3 crowns at least!) Exceptional welcome! Italy. A corner of paradise. USA. The "Hostess with the Mostess and a great sense of Humour. British. This is our third visit and we all want to return to the beauty and peace of this home and area. Many thanks to you. English/Chinese. We all love here, wonderful location and view, lovely host. I'm sure we will be back. German. Thank you for your warm welcome. West Australia. A super welcome. France. Super!!! Bon accueil! Very great. German. Thank you for all. When entering the village from the East/South. At the start of the Main Street is the Lochcarron Garage on the right hand side. Turn here and follow the road for approximately three quarter of a mile and Aultsigh is in front of you over the cattle grid. From Applecross, then come along the Main Street and turn left at the garage.